You may have noticed that celebrities like their cars. They’re not averse to a bit of social media, either. And their unique position in life means they have some entertaining experiences to share with us. 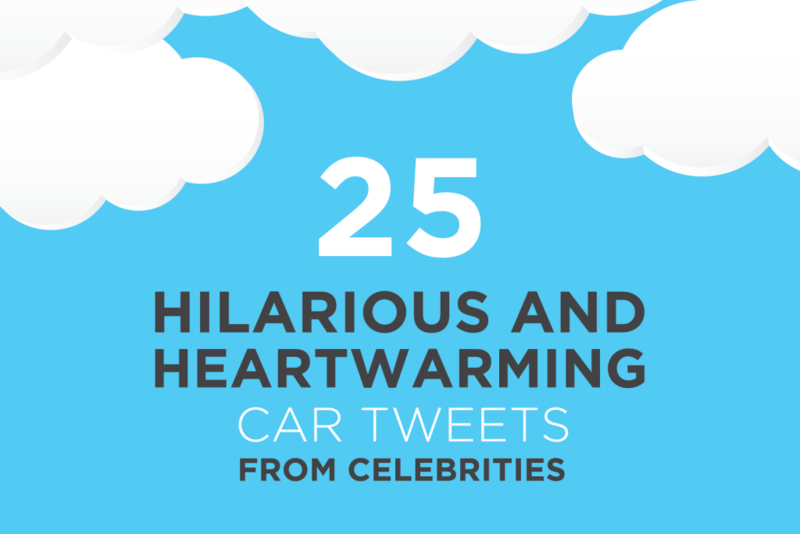 We’ve compiled 25 outrageous, funny and heartwarming car tweets to love. Like Conan O’Brien and a self-driving car with a penchant for drive-thrus. And Wiz Khalifa’s need for soundproof windows. If you’ve got time for a laugh and some warm inspiration, read the tweets in our infographic. After buying a house, a car is one of the biggest purchases we’re likely to make. So it’s good to know just what you’ll get for your money. That’s where the Monroney sticker makes an appearance, proudly displayed on the windshield or side window of new cars. The Monroney label is a window sticker that details essential information about the vehicle it’s attached to, enabling shoppers to evaluate it at a glance. Besides the suggested retail price, it includes information like engine specs, fuel economy, the annual fuel cost and what you might save on gas, vehicle emissions and safety ratings. Learn more about how the Monroney sticker helps when shopping for a new car. Bigger the better? Not always. There are some compelling reasons to consider a small car when you’re making your next vehicle purchase, from savings to versatility. For instance, a lower price tag and perhaps better miles per gallon than a large car are appealing. That’s no great surprise. But did you know that small cars are much safer than many people believe? They are also now equipped with the same technology features of bigger vehicles; there are some great luxury options, and you might even find the punchy driving style more enjoyable than that of bulkier rides. Still need convincing? Read 11 reasons to buy a small car. The auto financing process can be confusing, even intimidating, at times. The last thing you want is to end up with a loan that’s not right for your situation. However, there are some smart and simple ways to steer clear of a bad car loan. Incorporating advice from the Consumer Financial Protection Bureau and Federal Trade Commission, two government agencies looking out for consumers, we’ve outlined six steps to help. From knowing your credit rating to negotiating the purchase price, read our tips to avoid a bad car loan.